Learn about the design and the history of the flag of the State of Victoria. 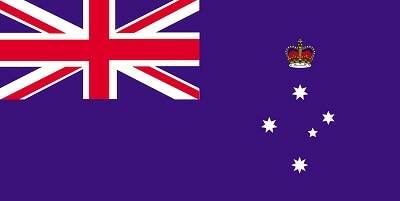 The flag of the state of Victoria is based on the blue ensign. It consists of a blue background with the Union Flag in the top pole-side quarter. In the background area there are five white stars representing the Southern Cross. Above the stars is a St Edward’s Crown. The stars don't have an identical number of points. The variation in the number of points represents their relative brightness in the constellation. The Imperial Parliament in the United Kingdom passed the Colonial Naval Defence Act. This act empowered Australian colonies to provide, maintain and use vessels of war. As a result of this, each colony needed to have its own distinctive flag. In December a dispatch from the Secretary of State for the Colonies required that all colonial vessels of war wear a Blue Ensign with the seal or badge of the colony in the fly (the half of the flag furthest from the staff) and a blue pennant. On 4 February the Governor proclaimed that the design of the Badge of the Colony of Victoria be of 'five white stars, representing the constellation of the Southern Cross'. I, the Governor of Victoria, do hereby direct that all vessels belonging to, or permanently in the service of the Government of Victoria, shall wear the Blue Ensign, having in the centre of the fly thereof the distinctive Badge of the Colony, viz – five white stars, representing the constellation of the Southern Cross, surmounted by an Imperial Crown. On 19 September The Honourable Sir John Madden KCMG, Lieutenant-Governor of Victoria, informed the Secretary of State for the Colonies that Victoria would now be referred to as a 'state' in place of the word 'colony'. He also advised that in the design of the state flag, the crown would take the form of the St Edward’s Crown. The design of the state flag has not changed since. Organisations can be notified when flags should be flown at half-mast or flown for special events by joining the Victorian Flag Notifications Network. Information about the Australian flag and a full range of national flag protocols can be found at the It’s an Honour website. Find out more about the Aboriginal and Torres Strait Islander flags. Information about the meaning of the parts of the Australian national flag and its history. Information about the Australian Aboriginal flag, the Torres Strait Islander flag and defence flags.